Even the most thoroughly debunked false claims about Israel often have a way of resurfacing in some form or another on social media or at mainstream news outlets. Earlier in the month, our colleague Sean Durns was responsible for a Washington Post correction to an op-ed by Richard Cohen that included the erroneous claim that there are “Jewish only roads” in the West Bank – a correction CAMERA had previously prompted at Associated Press, The Boston Globe and The Post itself several years earlier. As followers of this blog will recall, the Independent published an article recently which uncritically cited an alleged quote by David Ben-Gurion concerning “apartheid”, a quote – our research demonstrated – was almost certainly not accurate. 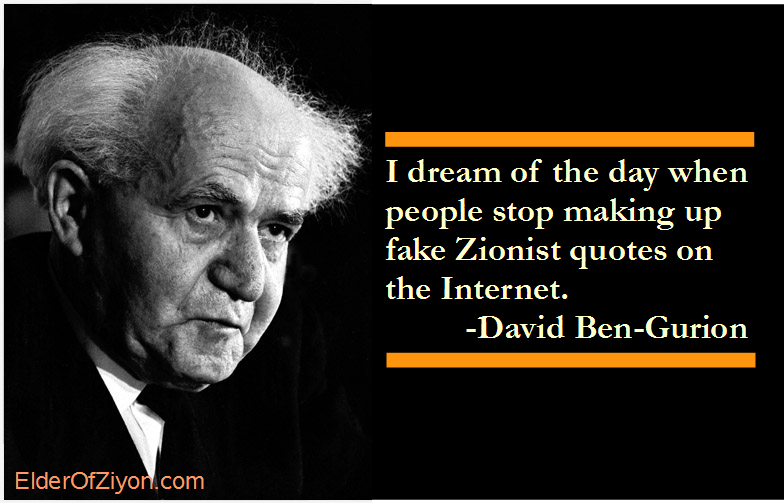 Indeed, CAMERA has multiple posts dedicated to false Zionist quotes, including several from Ben-Gurion and, in 2012, published a thorough refutation of the following quote attributed to the late Israeli prime minister. “We must expel Arabs and take their place”. Careful research by CAMERA demonstrated that the words – suggesting Ben-Gurion favoured the ethnic cleansing of Arabs – represented the opposite of the truth. Here’s what Ben-Gurion actually wrote in the letter in question. The scene was set in 1937 when Ben Gurion, the first prime minister of Israel, in a letter to his son wrote “Negev land is reserved for Jewish citizens, whenever and wherever they want… we must expel Arabs and take their places… and if we have to use force, then we have the force at our disposal…”. This was, and is, the Zionist mindset before the great Estate Agent in the sky decided who really owned the land of Palestine. In addition to the false quote concerning “expelling Arabs and taking their place”, the letter also distorts Ben-Gurion’s words concerning the Negev and the use of force. Here’s the actual sentence, again, translated into English by CAMERA. All of our ambitions are built on the assumption that has proven true throughout all of our activities in the land [of Israel] — that there is enough room for us and for the Arabs in the land [of Israel]. And if we will have to use force, not for the sake of evicting the Arabs of the Negev or Transjordan, but rather in order to secure the right that belongs to us to settle there, force will be available to us. As you can see, the actual Ben-Gurion quote has almost no resemblance to the way it’s presented in The Irish News letter. The “Zionist mindset”, as the letter writer put it, was not that Arabs should be expelled, but, rather, that there was room for both peoples in the land. Graphic created by Elder of Ziyon. I wonder why you very rarely, if ever, see or read protests about the “Great Population Exchange” that was part of the Treaty of Lausanne 1923. In that exchange 1.3 million Greek Orthodox adherents were transferred from Turkey to Greece and 800,000 Muslims were transferred from Greece to Turkey. The transfer was compulsory. For those who are unaware of this Treaty or find it hard to believe that such a compulsory transfer of populations can take place without an uproar below is Article 1 from the Treaty and a link for those who want to read the Treaty in full. As from the 1st May, 1923, there shall take place a compulsory exchange of Turkish nationals of the Greek Orthodox religion established in Turkish nationals of the Greek Orthodox religion established in Turkish territory, and of Greek nationals of the Moslem religion established in Greek territory. The link is not to Wikipedia but to the Foreign Ministry of Turkey. Not only do you mistake polemics for history, you have delusions of being a mind reader. While real estate prices are high in eastern Jerusalem, no “ethnic cleansing” is occurring there – except in the small cupboard you call “your mind”. As far as I know the story it was Goldmann who wrote about a nightly conversation with Ben Gurion where according to him such a sentence was expressed. He published this after Ben Gurion`s death, about thirty years after that alleged conversation.